These online games require only an Internet connection and a browser that supports mostly Java or Flash. They are intended for individual learners, are engaging, and are impossible to win without learning at least a little of the material. In this online computer game, players must figure out how to keep an Allosaurus from starving or being eaten until it grows to adulthood. This is an online adventure game in which players prospect for minerals on a virtual geologically realistic world. This strategy game has players prospect for oil using seismic profiles on limited budgets. Run competitive games run in class to motivate students. The instructor uses a series of games to help students identify and answer questions about fossils. The game grows more complex over time as the instructors add rules and phyla to identify. This quiz game is intended to help students review for an upcoming exam. Topics of questions are randomly determined by spinning a wheel. Teams answer questions using electronic CPS handhelds. This game has students simulate the propagation of P and S waves after an earthquake and to use the lag between these to determine where in the simulation the earthquake occurred. 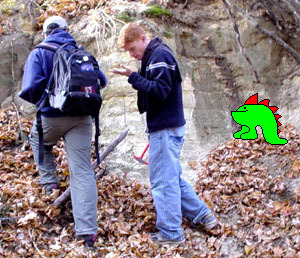 Get your students outdoors in teams competing to identify items in the field. Students are divided into teams, each of which is given a list of instructions and a GPS unit, and sent to find certain locations. At each stop, they identify a particular building stone or a plant. This exercise consists of a relay race in which students must identify specimens or answer questions at various stations. Take students into the field and give each team a list of rocks or mineral types you want found and brought back within the time limit.